 1     :                   '            (  '                                 W H AT M A K E S T H E F O R K M O S T P R O U D I S T O B E AT E G G S , A S I T I S A N E X T R A F AV O U R T H AT I S N O T P A R T O F I T S D U T I E S .
It may happen that mom says: ”Could you please set the table? Lay out spoons too, there’s soup for dinner”. It may happen that you receive a text: “Paul and Kate are coming for dinner tonight. 6et the table Zith our *io Ponti µatZare. <es, the new, odd one…”. It happens. It is the case when we treat ourselves with a beautiful table setting to have dinner alone after buying some Japanese take-away food. Or when in a spring morning we want to have breakfast on the terrace and we set a lovely table outdoor. It is the case also when you invite friends to play poker and the game becomes an excuse for staying together. The day for a family party or for a special buffet to listen to Ernest’s piano concert together. When it is raining outside and you rustle up a BBQ in the living room with your friends. 'aily acts, our acts. $ dish, µatware to the left, µatware to the right, µatware above. $ custom, a tradition: our tradition. Rituals that we repeat every day in many situations. The table embodies the traditions of the objects that populate it and is enliven by the stories of the people who use them. Whether it is an iPad, Charlie’s dinosaur or a ceramic anchovy placeholder, every day we set the table for one, ten, hundred people. Out of love, tradition or memory, our table experience is intended to be remembered over time. “I will never forget that, on the birthday of us grandchildren, my grandparents set the table for breakfast with cups depicting ancient Roman warriors on a biga. Hot chocolate, biscuits and a small golden spoon for the birthday boy or girl”. Si diploma in scenograÂ´a allâ&#x20AC;&#x2122;Accademia di Belle Arti di Brera e frequenta lâ&#x20AC;&#x2122;ambiente intellettuale e artistico milanese. Comincia come foto-reporter utilizzando il piccolo e il medio formato in bianco e nero prima di passare al colore e al grande formato. Contraria a una concezione settoriale e specialistica della fotograÂ´a, passa perĂ˛ presto anche alla moda, allâ&#x20AC;&#x2122;arredamento e, in tempi piĂš recenti, alla food-photography. A lei, scenografa di formazione, gli editori consentono di progettare, allestire e dipingere le grandi ambientazioni. Pubblica sulle riviste piĂš importanti di moda, design e arredamento, italiane ed estere. Maria Vittoria Backhaus earned a diploma in scenography from the Academy of Fine Arts of Brera and patronised the intellectual and artistic environment of Milan. She started working as a press photographer using black and white, small and medium formats. While she is against the idea of sectorial and specialist photography, she has soon expanded her activity also to fashion, dĂŠcor, and, more recently, food-photography. As she has a background in scenography, publishers allow her to design, create and paint major sets. Her works are published on the most important Italian and international fashion, design and interior magazines. Sergio Colantuoni arrived in Milan to earn a Master CertiÂ´cate from the cityâ&#x20AC;&#x2122;s Domus Academy, where Gianfranco FerrĂŠ was a teacher. Milan became his home. He had a fantastic time full of experiences as an editor at CondĂ¨ Nast, where he learned the art of mixing, choosing, selecting and designing fashion services. â&#x20AC;&#x153;I have never been interested in a garment but in what it represents. I have always considered a garment as a costume as I have designed fashion services beyond fashion trendsâ&#x20AC;?. He has worked with many fashion, design and food magazines, thus acquiring a thorough experience. He designs exhibitions, shops and trade shows for Pitti Immagine. â&#x20AC;&#x153;They can ask me to set up an exhibition, a trade show or a party, to dress a display window, or to design a shop. I do it with a photographic service in mind, by harmonising different sets and supervising food, music, colours and dĂŠcorsâ&#x20AC;?. Nel  Giuseppe Sambonet, Â´glio di un nobiluomo di Vercelli, dopo aver ottenuto il diploma alle Belle Arti, ottiene il brevetto di Maestro OreÂ´ce e costituisce la ditta Giuseppe Sambonet, depositando presso la zecca di Torino il punzone con le iniziali â&#x20AC;&#x153;GSâ&#x20AC;?. Agli inizi del Novecento la societj da lui fondata Ă¨ Fornitrice 8fÂ´ciale di molte famiglie nobili tra le quali la Duchessa di Genova ed il Conte di Torino. Nel 1932 Sambonet, prima in Italia, realizza un impianto produttivo su scala industriale capace di afÂ´ancare ad una produzione di argenteria massiccia quella in argenteria galvanica. Nel 1938 sviluppa un processo innovativo per la produzione di posateria in acciaio inossidabile e mette a punto la tecnica per lâ&#x20AC;&#x2122;argentatura dellâ&#x20AC;&#x2122;acciaio. Nel 1947 inizia con tecnologia propria la produzione di coltelli e lame in acciaio inox. Nel 1956 Sambonet conquista il mercato internazionale: prima su 53 concorrenti, si aggiudica la commessa per lâ&#x20AC;&#x2122;Hotel Hilton al Cairo con una linea di vasellame ancora oggi in collezione. In 1856, after earning a Fine Arts diploma, Giuseppe Sambonet, son of a nobleman from Vercelli, got a Master Goldsmith licence and established the company Giuseppe Sambonet, registering the seal bearing the initials â&#x20AC;&#x153;GSâ&#x20AC;? with the mint in Turin. By the early 2th century his company was the OfÂ´cial Supplier to many noble families, including the Duchess of Genoa and the Count of Turin. 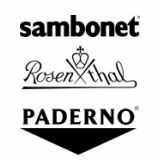 In 1932 Sambonet was the Â´rst company in Italy to build an industrial manufacturing plant for both sterling silver and galvanic silverware. In 1938 it developed an innovative process for the production of stainless steel Âľatware and a silverplated steel manufacturing technique. In 1947 it started manufacturing stainless steel knives and blades by using its own technology. In 1956 Sambonet conquered the international market as it was chosen from 53 competitors to supply the Hilton Hotel in Cairo with a hollowware line that is in its collection still today. Im Jahre 1856, nachdem Giuseppe Sambonet, Sohn eines $dligen von 9ercelli, mit einem Diplom der Kunstwissenschaften ausgezeichnet wurde, bekam er eine Goldschmiede-Meisterlizenz und gründete das Unternehmen Giuseppe Sambonet, es wurde mit den Initialen „GS“ registriert, die Prägeanstalt befand sich in Turin. Im frühen 20-sten Jahrhuntert war seine )irma of´zieller Hoµieferant vieler adliger Familien, einschließlich der Herzogin von Genua und dem Grafen von Turin. 1932 war Sambonet das erste Unternehmen in Italien, das einen industriellen Betrieb sowohl für Sterling Silber als auch für galvanisiertes Besteck aufbaute. Im Jahre 1938 wurde ein innovativer Prozess für die Produktion von Edelstahl Besteck und einer Herstellungstechnik für versilberten Stahl entwickelt. 1947 begann die Produktion von Edelstahl Messern und Klingen mit der eigenen Technologie. 1956 eroberte Sambonet den internationalen Markt, da es unter 53 Mitbewerbern auserwählt wurde, das Hilton Hotel in Kairo mit einer Bestecklinie auszustatten, die bis heute in der Kollektion verblieb. 8 elle développe un procédé innovant de fabrication de couverts en acier inox et une technique pour argenter l­acier. En 1947 elle commence à produire des couteux et des lames en acier inox en appliquant sa propre technologie. En 1956 Sambonet conquiert le marché international : choisie parmi 53 concurrents, l­entreprise reooit la commande de l­Hôtel Hilton du Caire pour la fourniture d­une ligne d­ustensiles à servir qui ´gure dans sa collection encore auMourd­hui. 8QD WDYROD EHQ DSSDUHFFKLDWD q LQGLFH GL UDIÂ´QDWH]]D H GL ERQ WRQ FRQIHUPD GHOOÂ­DWWHQ]LRQH H GHOOD FXUD FRQ FXL L padroni di casa amano ricevere i propri ospiti. Lâ&#x20AC;&#x2122;armonia q OD SHFXOLDULWj FKH LO JDODWHR ULFKLHGH D XQD WDYROD EHQ GLVSRVWDPDWUDSRVDWHSLDWWLELFFKLHULWRYDJOLDHWRYDJOLROL PD DQFKH FRQ FHQWURWDYROD VHJQDSRVWL H SRUWD SDQH RJQL elemento concorre al rito. Setting a table properly is a sign of reÂ´nement and bon ton, a testimony to the attention to detail hosts are willing to pay when they receive guests. Harmony is the peculiarity that etiquette requires for proper table setting, yet every item, including Âľatware, dishes, glasses, tablecloths and napkins, as well as centrepieces, placeholders and bread bins, contributes to this ritual. Einen Tisch angemessen zu decken ist ein Zeichen von Kultiviertheit und ein Zeichen des Guten Tones. Ein Bezeugnis des Gastgebers, Details zu achten und zu pÂľegen, wenn GĂ¤ste empfangen werden. Harmonie ist die Besonderheit, die die Etikette fĂźr eine komplett gedeckte Tafel fordert, jeder Gegenstand, einschlieĂ&#x;lich Besteck, Geschirr, GlĂ¤ser, TischwĂ¤sche und Servietten, auch HerzstĂźcke, Platzhalter und BrotkĂśrbe tragen zu diesem Ritual bei. Une table bien dressĂŠe est une marque de rafÂ´nement et de bon ton, tĂŠmoignant de lÂ­attention et du soin avec lesquels les maĂŽtres de maison veulent accueillir leurs convives. /Â­harmonie est la particularitĂŠ que lÂ­ĂŠtiquette impose pour le dressage de table ; en tout cas, chaque ĂŠlĂŠment, comme les couverts, les assiettes, les verres, la nappe et les serviettes, mais aussi le centre de table, les marque-places et la corbeille Ă pain, contribue Ă la rĂŠussite de ce rituel. FROWHOORFRQODPDYHUVRLOSLDWWRHLPSXJQDWXUDDGHVWUD IRUFKHWWDFRQLUHEELYHUVROÂ­DOWRHLPSXJQDWXUDDVLQLVWUD,OFXFFKLDLRSHULO GHVVHUWFRPHLOFROWHOORDYUjOÂ­LPSXJQDWXUDDGHVWUDHVDUjHVWHUQR Forks are placed to the left of the plate, in the order of use from the outside to the inside. There should be no more than three forks, with tines pointing up. Standard, Â´sh or meat knives are always placed to the right with blades turned toward the plate. The soup spoon, if any, is placed to the right, in the outermost position next to knives. Fruit and dessert Âľatware is placed horizontally above the plate with the following layout: knife with blade towards the plate and handle to the right, fork with tines pointing up and handle to the left. The dessert spoon is placed in the outermost position with the handle to the right, like the knife. Gabeln werden links des Tellers platziert, in der Reihenfolge der Nutzung von aussen nach innen. Es sollten nicht mehr als 3 Gabeln gedeckt werden, die Zacken nach oben. Standard Fisch- oder Fleischmesser werden immer rechts gedeckt, die Schneide in Richtung Teller. Der SuppenlĂśffel, falls eingedeckt, wird rechts, Ă¤uĂ&#x;erste Position neben den Messern platziert. Frucht- und Dessertbesteck wird horizontal, Ăźber dem Teller mit der folgenden Anordnung arrangiert: Messer mit Schneide in Richtung Teller, Griff nach rechts, Gabel mit Zacken nach oben und Griff nach links. Der DessertlĂśffel wird in der Ă¤uĂ&#x;ersten Position platziert mit Griff nach rechts zeigend, wie das Messer. /es fourchettes sont placĂŠes Ă gauche de lÂ­assiette, dans lÂ­ordre o elles doivent ĂŞtre utilisĂŠes, de lÂ­extĂŠrieur vers lÂ­assiette. Il ne doit pas \ avoir plus de trois fourchettes, les dents tournĂŠes vers la table. Les couteux, standard, Ă poisson ou Ă viande, sont toujours disposĂŠs Ă droite tranchant vers lÂ­assiette. La cuillqre Ă soupe, sÂ­il \ en a, est placĂŠe Ă droite, Ă cĂ´tĂŠ des couteaux. Les couverts Ă fruits et Ă dessert sont disposĂŠs horizontalement en haut de lÂ­assiette dans lÂ­ordre suivant : le couteau tranchant vers lÂ­assiette et manche Ă droite, la fourchette les dents tournĂŠes vers la table et manche Ă gauche. La cuillqre Ă dessert est placĂŠe Ă lÂ­extĂŠrieur, manche Ă droite comme le couteau. , SLDWWL SLDQL SRVDWL VX VRWWRSLDWWL R GLUHWWDPHQWH VXOOD WRYDJOLD VL GLVSRQJRQR D XJXDOH GLVWDQ]D OÂ­XQR GDOOÂ­DOWUR H se decorati, orientati verso lâ&#x20AC;&#x2122;esterno del tavolo e lâ&#x20AC;&#x2122;ospite per essere letti correttamente. 6HJXRQRLOSLDWWRIRQGRRODWD]]DSHULOFRQVRPPpRLOSLDWWR antipasto. Il piatto pane a sinistra e in alto del piatto piano. 6LSRVVRQRDSSDUHFFKLDUHÂ´QRDWUHSLDWWLLQFRQWHPSRUDQHD JOLDOWULFRPHTXHOORSHUOÂ­LQVDODWDVHJXRQROHSRUWDWHSRVWL VXXQWDYROLQRRVXXQFDUUHOOR,SLDWWLSHUOHSLHWDQ]HFDOGH vanno sempre serviti tiepidi. Flat plates, placed on show plates or directly on the tablecloth, are equally spaced one from another. If they are decorated, they are arranged toward the table edge and the guest to be seen properly. Soup plates or consommĂŠ bowls or hors dâ&#x20AC;&#x2122;oeuvre plates come next. The bread plate is arranged to the left of the Âľat plate, above it. Table setting includes the simultaneous presence of up to three plates, while other plates, like the salad bowl, accompany courses as they are served on a small table or a trolley. Hot food is always served on warm plates. Flache Teller, auf Platzteller gedeckt oder direkt auf die TischwĂ¤sche, sie werden mit gleichem Abstand nebeneinander platziert. Wenn die Teller dekoriert werden, werden sie in Richtung Tischkante gedeckt und so, dass der Gast gut zu sehen ist. Suppenteller, ConsommĂŠschĂ¤lchen oder 9orspeisenteller werden als nĂ¤chstes platziert. Brotteller werden links Ăźber dem Âľachen Teller arrangiert. Eine gedeckte Tafel beinhaltet das Eindecken von bis zu 3 Tellern, wĂ¤hrend z.B. das SalatschĂ¤lchen als Nebengedeck auf kleinen Tischchen oder auf Trolle\s serviert wird. HeiĂ&#x;e Speisen werden immer auf warmen Tellern serviert. Les assiettes plates, posĂŠes sur des plats de prĂŠsentation ou directement sur la nappe, sont disposĂŠes Ă la mĂŞme distance les unes des autres. Si elles sont dĂŠcorĂŠes, elles sont orientĂŠes vers le bord de la table et vers le convive pour ĂŞtre admirĂŠes correctement. 2n place ensuite lÂ­assiette creuse ou la tasse Ă consommĂŠ ou lÂ­assiette Ă hors dÂ­Â§uvres. LÂ­assiette Ă pain est posĂŠe Ă gauche devant lÂ­assiette plate. Il ne doit pas \ avoir plus de trois assiettes en mĂŞme temps sur la table ; les autres piqces de vaisselle, tels que le saladier, accompagnent les plats et sont posĂŠes sur une petite table ou sur un chariot. EnÂ´n, il faut toujours chauffer les assiettes destinĂŠes aux plats chauds. , ELFFKLHUL DOPHQR GXH H PDL SL GL TXDWWUR LQFOXVL DFTXD H FKDPSDJQH OHJJHUPHQWH D GHVWUD GHO SLDWWR GDYDQWL DO FROWHOOR,OSLJUDQGHSHUOÂ­DFTXDGRPLQDODFRPSRVL]LRQH TXLQGL TXHOOR SHU LO YLQR URVVR H TXHOOR SHU LO YLQR ELDQFR D GHVWUD 6H LO QXPHUR GHL ELFFKLHUL DXPHQWD SHU VHUYLUH SL YLQL RFFRUUH SRUOL D GHVWUD 3HU SDVWHJJLDUH D VROR FKDPSDJQHDSSDUHFFKLDUHFRQLOELFFKLHUHGDDFTXDROWUH DTXHOORGHGLFDWRDOOHÂŞEROOLFLQHÂŤ Glasses are at least two and no more than four, including water and champagne glasses. They are placed slightly to the right of the plate above the knife. The biggest glass for water stands out, while red wine and white wine glasses are placed to the right. If other glasses are added as more wine types are served, they should be placed to the right. If champagne is the only drink, lay out water glasses as well as champagne glasses. GlĂ¤ser mindestens zwei, aber nicht mehr als vier, inkl. Wasser- und Champagnerglas. Sie werden leicht rechts neben dem Teller, Ăźber dem Messer platziert. Das grĂśĂ&#x;te Glas, das Wasserglas, sticht heraus, wĂ¤hrend Rotwein und WeiĂ&#x;weinglĂ¤ser rechts platziert werden. Sollten mehrere verschiedene Weine serviert werden und andere GlĂ¤ser hinzukommen, sollten diese rechts platziert werden. Wenn nur Champagner serviert wird, werden sowohl Champagner als auch WasserglĂ¤ser eingedeckt. Les verres, au moins deux et jusquÂ­Ă quatre, \ compris les verres Ă eau et Ă champagne, sont placĂŠs lĂŠgqrement Ă droite de lÂ­assiette devant le couteau. Le verre le plus grand Ă eau domine la composition, alors que les verres Ă vin rouge et Ă vin blanc sont disposĂŠs Ă droite. Si de verres supplĂŠmentaires sont emplo\ĂŠs pour servir dÂ­autres vins, il faut les placer Ă droite. Lors dÂ­un repas accompagnĂŠ uniquement de champagne, ajoutez les verres Ă eau aussi bien que les verres pour savourer ce vin pĂŠtillant. 'LOLQRGLFRWRQHDIDQWDVLDRLQWLQWDXQLWDLOVHJUHWRqFKH VL LQWHJUL DOOD SHUIH]LRQH FRQ L WRQL GHOOÂ­RFFDVLRQH H FRQ JOL DOWUL SURWDJRQLVWL LQ WDYROD 3HU XQD WDYROD WUHQG\ VROR LQ SUHVHQ]DGLXQEHOWDYRORVRVWLWXLUHODWRYDJOLDFRQWRYDJOLHWWH DPHULFDQHUXQQHURUDIÂ´QDWLVRWWRSLDWWLSHURJQLRVSLWH $QFKH VH HVWUHPDPHQWH JUDGHYROL TXHVWH VROX]LRQL VRQR FRQVLJOLDWH SHU RFFDVLRQL LQIRUPDOL H VROR D SUDQ]R PDL SHU FHQD,OWRYDJOLRORqDOODVLQLVWUDGHOSLDWWR Whether it is a patterned or solid colour model made of linen or cotton, the secret is that it should perfectly Â´t both the tones of the occasion and the other protagonists of your table. If you already have a beautiful table and are seeking a trendy look, just replace the tablecloth with placemats, runners or reÂ´ned show plates for every guest. Even if they look very pretty, these solutions are recommended for informal situations and for breakfast only and never for lunch. Every napkin is placed to the left of the plate. 2b mit Muster oder einfĂ¤rbig, aus Leinen oder Baumwolle. Das Geheimnis ist, dass die TischwĂ¤sche sowohl die Farben des Anlasses widerspiegeln als auch perfekt zu den anderen Â¸AkteurenÂ­ der Tafel passt. Wenn Sie schon eine schĂśne Tafel haben, aber noch auf der Suche nach etwas Trendigem sind, ersetzen Sie einfach die TischwĂ¤sche mit Platzsets, LĂ¤ufern oder mit rafÂ´nierten Platztellern fĂźr all Ihre GĂ¤ste. Selbst wenn alles sehr schĂśn aussieht, diese 9orschlĂ¤ge werden nur fĂźr ungezwungene Gelegenheiten oder fĂźr das FrĂźhtĂźck empfohlen, jedoch nicht zum Lunch. Jede Serviette wird links neben dem Teller platziert. En lin ou coton, fantaisie ou unie, la nappe doit sÂ­harmoniser parfaitement aux tons de lÂ­occasion et aux autres protagonistes de la table. Pour crĂŠer une table tendance, mais seulement si vous disposez dÂ­une jolie table, remplacez la nappe par des sets de tables, des chemins de table ou des rafÂ´nĂŠs plats de prĂŠsentation pour chaque convive. MĂŞme si elles sont trqs agrĂŠables, ces solutions ne sont conseillĂŠes que pour des occasions informelles et pour le petitdĂŠjeuner, jamais pour un dĂŠjeuner. La serviette est placĂŠe Ă gauche du plat. YESTERDAY NIGHT ANGIE INVITED ME FOR DINNER. AT ONE POINT SHE TOLD ME: “ACT LIKE THIS IS YOUR HOME”. I HAD TO DO THE WASHING UP. IERI SERA SONO STATO INVITATO A CENA DA ANGIE. AD UN CERTO PUNTO LEI MI HA DETTO: “FAI COME SE FOSSI A CASA TUA”. HO DOVUTO LAVARE I PIATTI. G e s t e r n N a c h t h at m i c h A n g i e z u m D i n n e r e i n g e l a d e n . Au f e i n m a l s a g t e s i e z u m i r : “ F ü h l e D i c h w i e z u H au s e ” . I c h m u s s t e d e n A b wa s c h e r l e d i g e n .
Hier soir j’étais invité à dîner chez Angie. À un certain moment elle m’a dit: « Fais comme chez toi ». J’ai dû faire la vaisselle. AN OPTIMIST IS A PERSON WHO, WITHOUT A CENT IN HIS POCKET, ORDERS OYSTERS, HOPING TO BE ABLE TO PAY THE BILL WITH THE PEARLS HE FINDS. Le comble de l’optimisme, c’est de rentrer dans un grand restaurant et compter sur la perle qu’on trouvera dans une huître pour payer la note. E I N O PT I M I S T I S T E I N E P E R S O N , D I E K E I N E N C E N T I N D E R TA S C H E H AT, AU S T E R N B E S T E L LT, I N D E R H O F F N U N G, DA S S M A N D I E S E M I T D E N P E R L E N B E Z A H L E N K A N N , D I E M A N F I N D E T.
Hello Boys&Gs, stasera H19 da me?oki? Sono già li... ma hai preso da mangiare...? sereno... per te solo vino :)) Hi Guyz, perfect at 7pm.. see u ;-P Hi Peter!!! G man!! Please call Yumi :-) she doesn’t forgive me.. see u later alligator.. Yumi’s got a brand new bag!!! WE HAD GREAT FUN IN SPAIN THAT YEAR AND WE TRAVELLED AND WROTE AND HEMINGWAY TOOK ME TUNA FISHING AND I CAUGHT FOUR CANS. WIR HATTEN VIEL SPASS IN SPANIEN DIESES JAHR, WIR REISTEN, SCHRIEBEN UND HEMINGWAY NAHM MICH MIT ZUM THUNFISCH ANGELN. ICH ANGELTE 4 DOSEN. Nous nous sommes vraiment beaucoup amusés en Espagne cette année-là, nous avons bien voyagé et écrit. Hemingway m’a emmené à la pêche au thon et j’en ai pris quatre boîtes. EVERY TIME A CHILD SAYS, “I DON’T BELIEVE IN FAIRIES”, THERE IS A FAIRY SOMEWHERE THAT FALLS DOWN DEAD. OGNI VOLTA CHE UN BIMBO DICE: “IO NON CREDO ALLE FATE”, C’È UNA FATINA CHE DA QUALCHE PARTE CADE A TERRA MORTA. JAMES MATTHEW BARRIE Jedesmal wenn ein Kind sagt, ‘es glaube an keine Märchen’, wird irgendwo ein Märchen begraben. CHAQUE FOIS QU'UN ENFANT DIT : “JE NE CROIS PAS AUX FÉES”, IL Y A QUELQUE PART UNE PETITE FÉE QUI MEURT. Silver is a noble material, with a good resistance to the most acidic and alkaline substances found in foodstuffs. Aesthetically pleasing. Good resistance to corrosion. Can improve the µavour of certain food. L’argento è un materiale nobile con una buona resistenza alle sostanze più acide e alcaline presenti negli alimenti. Piacevole a livello estetico. Buona resistenza alla corrosione. Può esaltare il gusto di alcuni alimenti. Purity of silver 999.5. Silver layer hardness up to 2 times more than traditional silver plating. Sulphuration resistance up to 4 times more than traditional silver plating. Alpacca µatware: copper 66, nickel 13 and zinc 21. Stainless steel µatware: AISI 304. Purezza dell’argento 999,5. Durezza del rivestimento d’argento ´no a 2 volte superiore rispetto all’argentatura tradizionale. Resistenza alla solforazione ´no a 4 volte superiore rispetto all’argentatura tradizionale. Posateria Alpacca: rame 66, nickel 13 e zinco 21. Posateria acciaio inox: AISI 304. The thickness and the bond of the silver layer. The evenness and the brightness of the ´nished product. Lo spessore e l’aderenza del rivestimento d’argento. L’uniformità e la lucentezza del prodotto ´nito. Silber ist ein edles Material, das gegen die meisten Sluren und Alkale, die in der Nahrung zu ´nden sind, resistent ist. Ansprechend geschmackvoll. Resistent gegen Korrosion. Kann den Geschmack mancher Speise verfeinern. L’argent est un matériau noble ayant une bonne résistance aux substances les plus acides et alcalines contenues dans les produits alimentaires. Agréable esthétiquement. Bonne résistance à la corrosion. Il peut améliorer le got de certains aliments. Silber Reinheit 999.5). Silberbeschichtung zweimal hlrter als bei herk|mmlicher Versilberung. Widerstand gegen Schwefel bis zu 4 mal h|her als bei herk|mmlicher Versilberung. Alpaka Besteck: Kupfer 66, Nickel 13 und =ink 21. Besteck aus rostfreiem Edelstahl: AISI 304. Pureté de l’argent 999,5. Dureté du revrtement jusqu’à 2 fois supérieure à l’argenture traditionnelle. Résistance à la sulfuration jusqu’à 4 fois supérieure à l’argenture traditionnelle. Couverts en maillechort : cuivre 66, nickel 13 et zinc 21. Couverts en acier inox : AISI 304. DER VERSILBERUNGSPROZESS VON SAMBONET 817(5/,(*7675,.7(1.21752//(1(6:(5'(1 GEPRÜFT:  Dicke und Bindung der Silberbeschichtung  Gleichmlssigkeit und Glanz des fertigen Produkts. /(352&e'e'­$5*(1785(6$0%21(735e92,7'(6 CONTRÔLES TRÈS RIGOUREUX CONCERNANT:  L’épaisseur et l’adhérence du revrtement.  L’uniformité et la brillance du produit ´ni. 1(: SET 36 PCS MOKA / DESSERT SET 36 P= MOKA  DOLCE 6 P=. SET 24 PCS: 6 P=. 1(:SERVING SET 3 PCS CAKE SERVER SET PE==I A SERVIRE 3 P= PALA TORTA 1 P=. DESSERT SET 13 PCS SET DOLCE 13 P= 12 P=. FISH SET 24 PCS SET PESCE 24 P= 12 P=. FISH SET 26 PCS SET PESCE 26 P= 12 P=. TABLE SET TROUSSE 6 PCS SET TAVOLA 6 P= 1 P=. SET 24 PCS FOR 4 PERSON SET PER 4 PERSONE 24 P= 4 P=. SET 16 PCS FOR 4 PERSON SET PER 4 PERSONE 16 P= 4 P=. The gift box for following silverplated models is composed of a De Luxe case, including 12 pieces set of Sambonet antioxidizing cloth-case: Laurier, Saint Bonet, Baroque, Filet Toiras, Baguette, Linea Q, Hannah. La confezione regalo per i modelli in versione argentata: Laurier, Saint Bonnet, Baroque, Filet Toiras, Baguette, Linea Q e Hannah è costituita da un cofanetto tipo lusso, che comprende in omaggio una serie completa di 12 panni Sambonet antiossidanti. 42x32 cm 16 1/2 x 12 1/2 in. Ø 10 cm - 4 in. Ø 12 cm - 5 in. Ø 40 cm - 16 in. Composition - composizione Ø 28 cm - 11 in. Ø 10 cm - 4 in. Composition - composizione Ø 40 cm - 16 in. Ø 10 cm - 4 in. Ø 40 cm - 16 in. Ø 23 cm - h 20 cm Ø 9 in - h 7 in. 8,5 x 8,5 cm 3 x 3 in. 12 x 12 cm 5 x 5 in. 11 x 11 cm 4 1/2 x 4 1/2 in. 14 x 14 cm 5 x 5 in. 30 x 30 cm 11 x 11 in. 36 x 36 cm 14 x 14 in. 50 x 37 cm 20 x 14 in. 24 x 24 cm 9 1/2 x 9 1/2 in. 18 x 12 x 16,5 cm 7 x 4 3/4 x 6 1/2 in. 4 x 3,5 cm 1 1/2 x 1 3/4 in. 4,7 x 4 cm 1 3/4 x 1 1/2 in. 11 x 9,5 cm 4 3/8 x 3 3/4 in. 11 x 9,5 cm 4 3/8 x 3 3/4 in. 21 x 18 cm 8 1/4 x 7 in. 35 x 30 cm 13 3/4 x 11 3/4 in. Ø 40 cm Ø 15 3/4in. 40 x 27 cm 15 3/4 x 10 1/2 in. 35 x 35 cm 13 3/4x 13 3/4in. Ø 42 cm - Ø 16 in. 50 x 40 cm - 19 1/2 x 15 3/4 in. Ø 14 cm - 6 in. Ø 18 cm - 7 in. Ø 22 cm - 8 1/2 in. Ø 26 cm - 10 in. Ø 30 cm - 12 1/4 in. 12,5 x 12,5 cm 5 x 5 in. 12 x 12 cm 4 3/4 x 4 3/4 in. h 18,3 cm 18,5 x 12,8 cm h 7 1/2 in. 7 1/4 x 5 in. 28 x 28 cm 11 x 11 in. 30 x 30 cm 11 3/4 x 11 3/4 in. 43 x 28 cm 7x 11 in. 52 x 33 cm 20 1/2 x 13 in. 25 x 25 cm 9 1/2 x 9 1/2 in. 24 x 12 cm 9 1/2 x 4 3/4 in. 30 x 12 cm 11 3/4 x 4 3/4 in. 46 x 15,3 cm 18 x 6 in. Ø 20 - h 20 cm Ø 8 - h 8 in. Ø 24 - h 24 cm Ø 91/2 - h 91/2 in. h 61,8 cm h 24 5/16 in. 14 x 14 cm - 5 1/2 x 5 1/2 in. 19 x 14 cm - 7 1/2 x 5 1/2 in. 30 x 9 cm - 11 3/4 x 3 9/16 in. 19 x 19 cm - 7 1/2 x 7 1/2 in. 24 x 24 cm - 9 7/16 x 9 7/16 in. h 14,5 cm - 5,2 x 5,2 cm - 310 ml. h 5 11/16 in. - 2 x 2 in. - 11 oz. h 12 cm - 5,2 x 5,2 cm - 240 ml. h4 11/16 in. - 2 x 2 in. - 8 1/2 oz. h 4,5 cm - 5,2 x 2,6 cm 1 5/8 in. - 2 x 1 in. 14 x 14 cm. - 5 x 5 in. 10,4 x 10,4 cm - 4 x 4 in. 10,4 x 15,4 cm - 4 x 6 in. 16 x 16 cm - 6 1/4 x 6 1/4 in. 21 x 21 cm - 8 1/2 x 8 1/2 in. h 6 cm - 5,2 x 5,2 cm - 160 ml. h 2 3/8 in - 2 x 2 in.- 5 2/3 oz. 5,2 x 5,2 cm - 2 x 2 in. h 3,5 cm - 10,4 x 5,2 cm h 1 3/8 in. - 4 1/8 x 2 in. h 2,5 cm - 5,2 x 5,2 cm - 68 ml. h 1 in. - 2 x 2 in. - 2 2/5 oz. 8,3 cm - 3 1/4 in. 19 x 19 cm. - 7 1/2 x 7 1/2 in. h 9 cm - 5,2 x 5,2 cm h 3 9/16 in.- 2 x 2 in. h 6 cm - 5,2 x 5,2 cm h 2 3/8 in. - 2 x 2 in. 24 x 24 cm. - 9 7/16 x 9 7/16 in. h 9 cm - 10,4 x 2,6 cm h 3 9/16 in. - 4 1/8 x 1 in. h 12 cm 5,2 x 5,2 cm - 240 ml. h 41 1/16 in. 2 x 2 in. - 8 1/2 oz. h 11,5 cm - 5,2 x 5,2 cm h 4 1/2 in. - 2 x 2 in. 24 x 24 cm 9 7/16 x 9 7/16 in. 200 gr. - 7 oz. 15 cl. - 4 oz. 21 cl. - 7 2/5 oz. 40 cl. - 14 oz. 100 cl. - 35 1/3 oz. 25 cl. - 8 5/6 oz. 54 cl. - 19 oz. 72 cl. - 25 2/5 oz. 27 cl. - 9 1/2 oz. 52 cl. - 18 1/3 oz. 72 cl. - 25 1/3 oz. 160 cl. - 56 1/2 oz. 160 cl. - 56 1/2 oz. h. 18 cm - h 7 1/8 in. 47 cl. - 16 1/2 oz. h. 6,5 cm - h 2 9/16 in. Ø 9,5 x 7 cm - 30 ml. 3 3/4 x 2 3/4 in. - 1 oz. 22 x 14 cm 8 11/16 x 5 1/2 in. 35 ml. - Ø 5 cm oz. 11/4 - 2 in. Ø 10 cm - Ø 315/16 in. Ø 20 cm - Ø 7 7/8 in. h. 14 cm - Ø 10 cm h. 5 1/2 in. - Ø 3 15/16 in. Ø 5 cm h 33 cm - Ø 2 in. h 13 in. Ø 5 cm h 28 cm - Ø 2 in. h 11 in. Ø 5 cm h 24 cm - Ø 2 in. h 9 in. Ø 8 cm - Ø 3 1/8 in. 13,3 x 13,3 cm - 5 x 5 in. 24,5 x 10 cm - 9 1/2x 4 in. h 14,2 cm - 16,4 x 12,7 cm h 59/16 in. - 67/16 x 5 in. h 21,2 cm - 15 x 12 cm h 83/8 in. - 515/16 x 411/16 in. h 20,3 cm - 24 x 19,5 cm h 8 in. - 97/16 x 711/16 in. h 61,8 cm - h 245/16 in. 34 x 24 cm - 13 3/8 x 9 1/4 in. 39 x 26 cm - 15 3/8 x 10 7/16 in. 44 x 26,5 cm - 17 15/16 x 10 7/16 in. 34 x 24 cm - 13 3/8 x 9 7/16 in. 39 x 26 cm - 15 9/16 x 10 1/4 in. 35,5 x 22,5 cm - 13 3/4 x 81 1/16 in. 41 x 26,5 cm - 15 15/16 x 10 7/16 in. 24,5 x 24,5 cm 9 5/8 x 9 5/8 in. Ø 27 cm - Ø 10 7/16 in. Ø 32,5 cm - Ø 12 5/8 in. Ø 36,5 cm - Ø 14 3/8 in. 47,5 x 17 cm - 18 11/16 x 6 11/16 in. 64 x 24,5 cm - 25 3/16 x 9 3/16 in. 56 x 38 cm - 22 1/2 x 14 3/4 in. Ø 40 cm - Ø 15 3/4 in. Ø 32 cm - Ø 12 5/8 in. Ø 38 cm - Ø 14 15/16 in. Ø 18,5 cm - Ø 7 1/8 in. Ø 50 cm - Ø 19 11/16 in. 49,5 x 29 cm 19 11/16 x 1 17/16 in. 38 x 18 cm - 14 15/16 x 7 1/8 in. 18 x 13 cm - 7 1/8 x 5 1/8 in. Ø 9 cm - Ø 3 9/16 in. Ø 7,5 cm - Ø 2 15/16 in. 36 - 47 cm 14 3/16 - 18 1/2 in. Ø 36,5 cm - Ø 14 1/8 in. 39 x 26 cm 15 3/8 x 10 1/4 in. 41 x 26,5 cm 16 1/8 x 10 1/2 in. 30 cl. - 11 oz. 60 cl. - 21 1/2oz. 90 cl. - 32 oz. 160 cl. - 57 oz. 15 cl - 5 1/2 oz. 200 gr. - 7 oz. 260 gr. - 9 oz. 260 gr. - 9 oz. 30 cl. - 11 oz. 60 cl. - 21 1/2 oz. 90 cl. - 32 oz. 160 cl. - 57 oz. 30 cl. - 11 oz. 50 cl. - 17 1/2 oz. 120 cl. - 40 oz. 30 cl. - 11 oz. 60 cl. - 21 1/2 oz. 100 cl. - 33 1/2 oz. h 9,5 cm - Ø 8,5 cm. h 3 1/4 in. - Ø 3 1/4 in. Ø 12 cm. - Ø 4 3/4 in. Ø 9 cm. - Ø 3 1/2 in. 24 x 15 cm. - 9 x 6 in. 30 x 19 cm. - 12 x 7 1/2 in. Ø 31 cm - Ø 12 1/4 in. Ø 13,8 cm - Ø 5 in. 15 cl. - 5 oz. 24 cl. - 8 oz. For high performance, before use ZDUPWKHSRW´OOLQJZLWKKRWZDWHU Per ottimizzare l’impiego, preriscaldare con acqua calda prima dell’uso. Um die Leistungen zu optimisieren, die Kanne mit heißem Wasser vor dem Gebrauch vorwärmen. Avant l’usage remplir avec de l’eau chaude. h 20,5 cm - 19 x 10,5 cm h 8 in. - 7 1/2 x 4 in. h 20,5 cm - Ø 19 cm h 8 in. - Ø 7 1/2 in. Ø 21,5 cm - h 12 Ø 8 1/2 in. - h 4 3/4 in. Ø 22 cm - h 11 Ø 9 in. - h 4 1/2 in. Ø 28 - h. 9,5 Ø 11 - h. 3 3/4 in. Ø 20,5 cm - h. 18,5 cm Ø 8 in. - h. 7 1/4 in. h 14,5 cm - h 5 1/2 in. h 24,5 cm - Ø 23 cm h 9 1/2 in. - Ø 9 in. h 15 cm - Ø 16,4 cm h 6 in. - Ø 6 1/2 in. h 16 cm - Ø 18,5 cm - h 6 1/4in. - Ø 7 1/4 in. h 21 cm - Ø 21 cm - h 8 in. - Ø 8 1/4 in. h 13 cm - Ø 12,5 cm h 5 in. - Ø 47/8 in. 50 cl - 165/8 in. Ø 9 cm - Ø 3 1/2 in. 12,5 x 6,5 cm 5 x 2 1/2 in. h 14,4 cm h 5 1/2 in. Ø 45 cm - L 20 Ø 17 1/2 in. - 5 gal. h 63 cm - h 24 3/4 in. h 68 cm - h 26 3/4 in. esterno 28 x 20 cm - interno 26 x 18 cm outside 11 3/4 x 7 3/4 in. - inside 10 1/4x 7 in. esterno 35 x 30 cm - interno 31 x 27 cm outside 13 3/4 x 11 3/4 in. - inside 12 1/4 x 10 1/2 in. esterno 40 x 26 cm - interno 35 x 22 cm outside 15 3/4x 10 1/4 in. - inside 13 3/4 x 8 3/4 in. esterno 50 x 38 cm - interno 44 x 32 cm outside 19 1/2 x 15 in. - inside 17 1/4 x 121/2 in. esterno 40 x 26 cm - interno 35 x 22 cm outside 15 3/4 x 10 1/4 in. - inside 13 3/4 x 8 3/4 in. esterno 50 x 38 cm - interno 44 x 32 cm outside 19 1/2 x 15 in. - inside 17 1/4 x 12 1/2 in. esterno Ø 30 cm - interno Ø 24 cm outside Ø 12 3/4 in. - inside Ø 9 1/2 in esterno Ø 35 cm - interno Ø 27 cm outside Ø 13 3/4 in. - inside Ø 10 1/2 in esterno Ø 40 cm - interno Ø 31 cm outside Ø 15 3/4 in. - inside Ø 12 1/4 in. esterno Ø 31 cm - interno Ø 19,6 cm outside Ø 12 1/4 in. - inside Ø 7 3/4 in esterno Ø 33 cm - interno Ø 20,5 cm outside Ø 13 in. - inside Ø 8 in. esterno Ø 35 cm - interno Ø 31 cm outside Ø 13 3/4 in. - inside Ø 12 1/4 in. esterno Ø 40 cm - interno Ø 35,5 cm outside Ø 15 3/4 in. - inside Ø 14 in. esterno Ø 30 cm - interno Ø 25,5 cm outside Ø 1 1 3/4 in. - inside Ø 10 in. esterno Ø 35 cm - interno Ø 31 cm outside Ø 13 3/4 in. - inside Ø 12 1/4 in. esterno Ø 40 cm - interno Ø 35,5 cm outside Ø 15 3/4 in. - inside Ø 14 in. esterno 55 x 23 cm - interno 47 x 16 cm outside 21 1/2x 9 in. - inside 18 1/4x 6 1/4 in. esterno 65 x 27 cm - interno 56 x 18 cm outside 25 1/4x 10 1/2 in. - inside 22 1/2x 7 in. esterno 74 x 29 cm - interno 65 x 20 cm outside 29 1/2 x 11 1/2 in. - inside 25 1/2 x 7 7/8 in. 21 x 11 - 8 1/4 x 4 3/8 in. 25,5 x 13 - 10 x 5 1/8 in. 29 x 15,5 - 11 3/8 x 6 1/8 in. 33 x 17,5 - 13 x 6 7/8 in. 39 x 23 - 15 3/8 x 9 in. esterno 30 x 19 cm - interno 24 x 13 cm outside 11 3/4 x 7 1/2 in. - inside 9 1/2x 5 in. esterno 35 x 22 cm - interno 28 x 16 cm outside 13 3/4 x 8 1/2 in. - inside 11 3/4 x 6 1/4 in. esterno 41 x 26 cm - interno 34 x 19 cm outside 16 3/4 x 10 1/4 in. - inside 13 3/8 x 7 1/2 in. esterno 46 x 29 cm - interno 38 x 21 cm outside 18 3/4 x 11 1/2 in. - inside 15 3/4 x 8 1/2 in. esterno 54 x 37 cm - interno 43 x 26 cm outside 21 1/2 x 14 1/2 in. - inside 17 1/2 x 10 1/4 in. 49 x 37 cm - 191/4 x 141/2 in. 30 cl. - 11 oz. 60 cl. - 21 1/2 oz. 15 cl. - 5 1/2 oz. 35 cl. - 12 oz. 60 cl. - 21 1/2 oz. Ø 12,8 cm - Ø 5 in. h 21 cm - Ø 19 cm h 8 1/2 in. - Ø 7 1/2in. h 22,5 cm - 19 x 10,5 cm h 93/8 in. - 71/2 x 41/8 in. 5 x 3 cm - 2 x 1 in. h 9 cm - Ø 10,5 cm h 31/2 in. - Ø 4 in. Relish dish, 3 compartments Portasalatini 3 comparti Salzgebäckständer, 3 - tlg. Porte-appetizers, 3 compts. ESTERNO Ø 31 cm INTERNO Ø 19,8 cm OUTSIDE Ø 12 1/4 in. INSIDE Ø 7 3/4 in. ESTERNO Ø 36 cm INTERNO Ø 31 cm OUTSIDE Ø 14 1/8 in. INSIDE Ø 12 1/4 in. ESTERNO Ø 41 cm - INTERNO Ø 35 cm OUTSIDE Ø 16 in. - INSIDE Ø 13 3/4 in. 31 x 20 cm - 12 1/4 x 7 3/4 in. 36 x 23 cm - 14 1/4 x 9 in. 42 x 27 cm - 16 1/2 x 10 1/2 in. 47 x 30 cm - 18 1/2 x 12 in. 54 x 36 cm - 21 1/4 x 14 1/8 in. ESTERNO 29 x 21 cm - INTERNO 25 x 17 cm OUTSIDE 11 1/2x 8 1/4 in. - INSIDE 9 7/8x 6 1/2 in. esterno 40 x 27 cm - interno 33 x 20 cm OUTSIDE 15 3/4x 10 3/4 in. - INSIDE 13 3/4x 7 7/8 in. esterno 50 x 38 cm - interno 44 x 32 cm OUTSIDE 20 3/4x 15 in. - INSIDE 17 3/8x 12 1/2 in. ESTERNO 29 x 21 cm - INTERNO 25 x 17 cm OUTSIDE 11 1/2x 81/4 in. - INSIDE 9 7/8x 6 1/2 in. 15 cl. - 5 oz. 24 cl. - 8 oz. 25 x 16 cm - 9 1/4 x 6 1/4 in. h 16 cm - Ø 18 cm h 6 1/4 in. - Ø 7 in. h 25,5 cm - Ø 20,5 cm h 10 in. - Ø 8 in. h 18,5 cm - 71/4 in. h 19,5 cm - 71/2 in. h 30 cm - h 11 3/4 in. h 19,5 cm 40 x 27 cm h 7 5/8 in. 153/4 x 103/4 in. tokyo MAX LOAD 30 KG. PORTATA MAX 30 KG. 70 x 45 cm - h 70 cm 9 Kg. c.ca 271/2 x 173/4 in. - h 271/2 in. approx. weight 197/8 lb. 70 x 45 cm - h 90 cm 11 Kg. c.ca 271/2 x 173/4 in. - h 351/2 in. approx. weight 241/4 lb. Ø 2,5 cm h 6 cm Ø 1 in. h 23/8 in. Ø 6,3 cm h 2,5 cm Ø 21/2 in. h 1 in. Ø 7,2 cm h 7 cm Ø 23/4 in. h 23/4 in. h 31 cm - 20 x 8 cm h 12 1/4 in. - 7 7/8 x 3 1/8 in. 50 x 15 cm 19 5/8 x 5 7/8 in. A RT D I R E CT I O N Sambonet Paderno Industrie S.p.A.
© C O PY R I G H T Ogni riproduzione anche parziale del presente catalogo è vietata se non espressamente autorizzata per iscritto da Sambonet Paderno Industrie S.p.A. This catalogue may not be reproduced in whole or in part unless speci´c prior written authorization of Sambonet Paderno Industrie S.p.A. Le misure, caratteristiche ed illustrazioni dei prodotti sono indicative e soggette a variazioni senza preavviso qualora esigenze tecnico produttive lo richiedessero. The pictures illustrated and data are representatives. We reserve the right to alter at any time the speci´cations stated without notice, whenever technical requirements shall so demand. 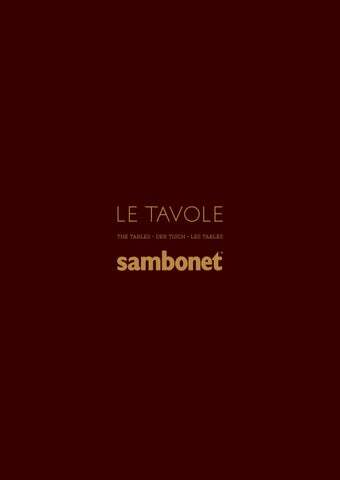 © SAMBONET PADERNO INDUSTRIE S.P.A.
Set the table is a pleasure to live and share, every day.